"What are you upto madam?" asked the shopkeeper of the mom's favorite dairy products shop, after he noticed me inquiring, pressing hundredth time the block of paneer he had handed to me ten minutes ago. Almost, embarrassed by his tone, I blurted out, I was just curious how they got that paneer to be so soft and spongy. Not expecting an answer, after all his business relied on it, I looked up at M, who was clearly annoyed he was getting late, the shopkeeper like a true Indian salesman said "You have to buy milk from us for that". Mom has warned me not to buy milk from him already "Way to expensive and its as thin as water" she complained. Bhai (brother) do you use lime to split it? How much do you add bhai? Oh good, I do it that way, what's in your milk you say? With that, and looking at the number of cusomters he had to attend to, I left it at that. Though I couldn't get anything too useful from him, he actually helped me find what I was doing right. 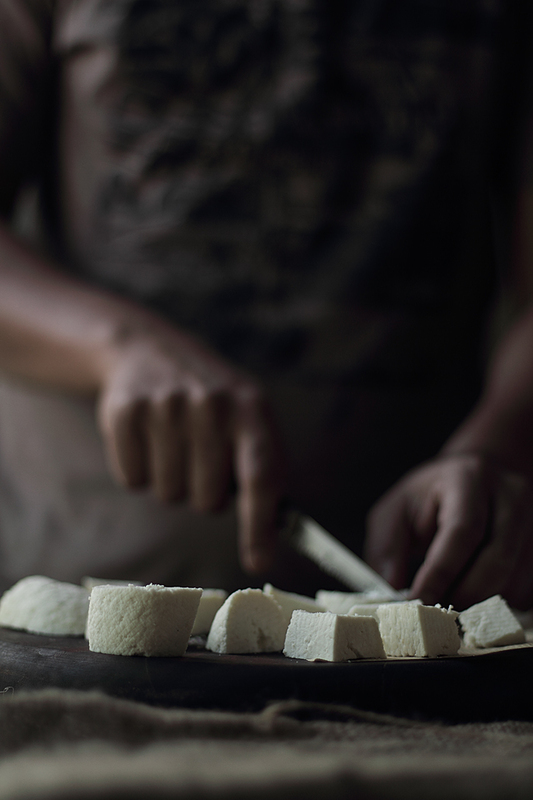 For years, friends have asked me how I make my paneer. My answer is simple, boil the milk, split it with acid, remove the whey, put weight on it and that's it. Quite a few friends where not able to recreate the results. So today I'm sharing my technique in detail for making paneer and a few tips I hope will help you get through paneer making. Because trust me, once you make your own, you will never go back to store bought. Paneer is a soft fresh Indian cottage cheese made by simply using acid and no rennet. From sweets, to snacks, curries and even flat breads, one or the other form of this cheese is used in North Indian cuisine extensively. Paneer can also be used in kebabs and tikka as an addictive vegetarian option. No one is going to miss the meat! Heat the milk in the deep and heavy bottom pan at medium heat. Let it come to a gentle boil and stay there for a minute. Make sure the milk is not vigorously boiling. If it does, reduce the heat and bring the milk back to gentle boil. Add one tablespoon of juice and quickly stir it in. At this point, you will start to see small curdles in the milk but no whey. Add another tablespoon of juice and again stir it in. The curdles will increase and you will slowly begin to see the greenish whey. Add the last tablespoon of juice and with this, you should be able to see a clear greenish whey separating from the curdles, switch of the gas immediately at this point. Depending on the acidity of the juice, the amount of juice you require may differ. Start with one tablespoon at a time till you achieve the results. Line another pan with double layered cheesecloth. Make sure the cheesecloth is long enough to be bundled up and hanged later. Run the whey through the cloth which will collect all the curdles. Wash the curdles, by running it through cold water to remove the lemon taste. Tie up the cheesecloth in a tight bundle and let it drain for about 30 minutes. Then place weight on the cheese to get it to be flatter and drain out extra moisture. I generally place it between two cutting board and add heavy pot on top for 1-2 hour.You don't want to add too much weight for too long as it can drain out way too much moisture from the cheese making it hard and crumbly. Wrap it and store it in the fridge for upto a week. But I certainly prefer to use it as early as possible. For using in curries, cut them into similar size cubes. You might want to trim out those irregular edges to get even cubes. Keep those irregular edges and crumbles, I have a recipe for that coming up! Tip: Use the leftover whey for pancakes, making roti or other bread, add to smoothies, thin out yogurt with the whey for yogurt drinks, or use it to water the plants. I always make Paneer at home and you are right once you eat homemade Paneer you never want to buy it! Love your clear instructions and of course beautiful photos! I have been making paneer for more than 10 years now and this post re-confirmed my evident belief :) Nice post there! I am also thinking, the recent crumbliness of my paneer was because of the (too much)weight I put, in a hurry. Thanks for that tip. I read that this makes about 8oz. You will need 4.4 of these recipes, or 8.8 liters of milk. Exactly what I was thinking AOP! Gorgeous photos! Forget about the Paneer..the photos are almost as good to eat! I can;t believe it can be that simple.I mean,time consuming yes but not as hard as I would have thought! Great post and tutorial! i prefer homemade paneer to store bought ones. love the pic of the cheesecloth. useful post ! You put it so elegantly! Baeutiful. I really have to make that speciality. Thanks for sharing! Lovely moody clicks. Thanks so much for this tutorial. I asked an indian friend of mine why restaurants often use tofu instead of paneer and she said becuase it was so hard to make. But i knew thar couldn't be true. It's just like making ricotta with out the pressing. I love indian food and just recently have gotten up the nerve to start making it myself. So your blog and pictures are quiet inspiring. Thanks! Loooove this! I want to DRINK it. Will definately try to make this at home one of these day. Everyone I know cooks with Nanak (Frozen panner) here and I don't think that stuff is good for you. Homemade paneer is kind of like homemade pasta isn't it? Once you have tasted the real deal, that's it! Beautiful photos and play of light! I'm not a fan of paneer. But those pictures, sigh. Girl, it's awesome!! Truly awesome. I'm especially smitten with that second shot, ha. Thanks Kulsum. I am recently able to purchase paneer but it is not like what I have had in restaurants or what you have pictured. Instead it is very firm and solid - even more so than extra firm tofu. I am anxious to make this (after I have used the block I bought). I have many uses for the whey. About how much paneer does this recipe make? Love love LOVE the dark tones of these photos! And also adore homemade paneer. As I told Prerna while I was in Cali, once I went homemade I never intend to go back. I've tried this at home...learned it from my north indian roommate in college...only issue was that it never set into perfect cubes like yours...gonna reread how you did it closely and learn the magic! 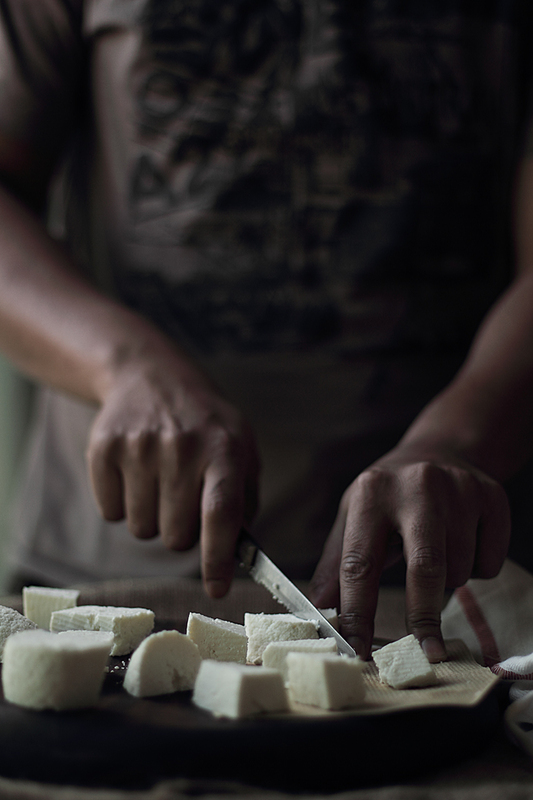 Love paneer and never bothered to make it at home till I saw this.Love your pictures and the dark wood cutting board..
Beautiful photos Kulsum and loving the hand model too. I have a habit of asking those kind of questions at restaurants- never quite get a good answer though! @Kelly It would make about a cup. Will add that to that post. you're right! it does sound easy to make. i bought some cheesecloth back from the States so may give this a try. Thanks! Thanks so much for sharing! 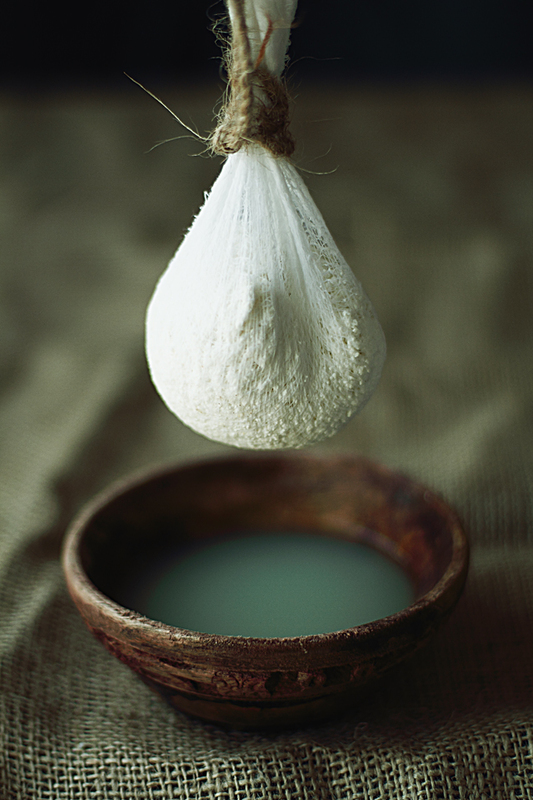 I tried ricotta and cream cheese recently, and now regularly keep a stock of cheesecloth...might have to put some of that to use making paneer! Your photographs are stunning, and I've always wanted to make paneer. What a lovely blog! the photos are so lovely. I use white vinegar because everytime I used lemon juice, the paneer gave out a lemon taste but vinegar didnt. Does your paneer taste free of that lemony essence? @Sliceofmylyfe Thank you :-) If you thoroughly wash the paneer before draining and weighting it down it doesn't taste of lemon at all. Thank you for this great tutorial! I have wanted to make curries with paneer but haven't been able to find paneer at the store. I never thought to make it myself! Perfect! I love paneer and thank you so much for sharing your paneer making tips Kulsum. And those photos......WOW!!! I really, really want to try making paneer at home. Great share. I always wondered how to make a good paneer. Now I need to go to the kitchen and try it out. I think ur recipe index needs some updating...I told a fren of mine to search for something on ur blog in the Index, but it was not there. I hope u dont mind pointing it out, but consider me a fren who tells the other tht something is clinging on the tooth after lunch together. I have never tasted paneer but sounds good! Is it similar to hallomi cheese? Not really its not salted as hallomi is and it has more of a crumble texture. It absorbs flavor very well so works great with spices. Wow! I didnt know that this was the name of the cheese my grandmother sister would make for our family when we visit her. She also add some salt on hers and her milk was straight out of the cow (which as a kid I thought it was so gross) then she would form it in an old tin tuna can. It was the best cheese I taste ever! Very interesting - wonderful photography! I use the whey in soup. Its very nourishing. Also, For two variations on paneer I've toasted sesame seeds and cumin seeds and added them to the curd before pressing. Yummy! THANK YOU! I have been wanting to make some recipes with paneer, but as we live in Germany, out in the country, I haven't been able to find a store that carries it. This is going to be amazing! ahhh this looks so good..and I love all of the ingredients. I must try it. thank you for such a beautiful presentation. I want to become an old woman and settle down and learn all about cooking again..instead of trying to keep up with the insanity of going to work and managing so much..but then again...the modern world of today gave us web pages and blogs like this...so it is a "good thing". Gorgeous! Sent here for the recipe from 101 Cookbooks - can't wait to try this! Thank you so much for your prompt response. I made it Saturday morning using a thin cotton cloth as per your suggestion and it was really incredibly good. The best Paneer I ever tasted. I'm making it again today: YAY! So glad to hear that Mike! Thanks for trying. Your pictures are some of the most beautiful I've seen. Thank you for sharing your technique and art. Quick question, *how* do you weigh down the paneer? Do you keep it in the cheesecloth while it's being weighed down? Do you leave it on the counter while it's being weighed down or do you put it in the fridge? When the process is finished, does it need to be stored in liquid (possibly the whey)? I've been admiring your blog for quite some time now and finally made paneer this week. It's d e l i c i o u s! And even my sourdough bread came out much better using the whey. Thanks for creating such a wonderful blog and sharing your culinary delights with us. Thank you for taking the time to give your feedback :) I'm glad it worked for you! I have never thought of trying to make paneer at home either! I am definitely going to make it now!! Thank you so much for sharing. Sounds delicious but I am on a low fat diet, can you use skim milk and make it fat free? I'm pretty sure you can but I haven't personally tried it. If you try it please share the results. Made this earlier today and had in "chilli paneer" for dinner, and turned out great. I was surprised how easy it was to make the paneer, and I think I'll be making it ever few weeks for different Indian dishes, now. Doesn't your paneer get khatta with the lime juice?? In my grandmother's house (Punjabi) they add homemade curd to boiling milk to make the paneer and our Bengali cook at my parents home uses 2 tablespoons of vinegar for every 1 kilo of milk to make the paneer. The best so far has been the one made from curd. Its the softest paneer ive ever had, the vinegar one is similar, but the curd one just melts in your mouth - ideal for making pallak paneer. The vinegar one is ideal for making paneer bhurji. No the paneer doesn't get sour at all. After the whey separates the paneer is washed with cold water which gets rid of any citrus flavor and more importantly it stops the paneer from cooking any further (which can lead to rubbery paneer). I'm assuming that the curd Gayatri mentioned is yogurt. Is that correct? What about using Greek Yogurt? I understand that Greek Yogurt is very sour tasting. If you were to use yogurt instead of Lime or Lemon Juice, how much yogurt would you use per kilo of milk? I guess just as you used the lime juice, you would start with a tbsp and keep adding tbsps until the whey separates. I was glad to hear that washing the curds stops the cooking so that the curds are not rubbery. I love Saag Paneer and am so very happy to get the recipe and for the Paneer as well. I am going to bookmark your site so I can check it out further. What do you use paneer for? Is it like a cream cheese? Can you use it like a cream cheese in recipes? Do you spread it on crackers or bread? I am not sure if I have ever eaten it before. Although I have had much Indian food, as my son-in-law is Pakistanian. 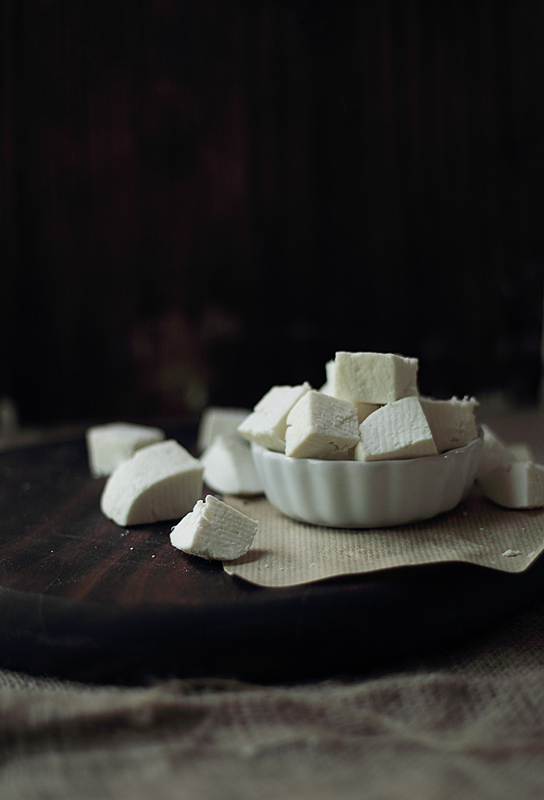 Deb - Paneer is not a spreadable cheese, it is soft but a solid cheese used mostly in cube form in Indian recipes. If you search for paneer on the blog you shall find a few recipes. Hope that helps! :-D So good to know! Hi there! Towards end of the post I have suggested some uses of the whey. But you can use it for soups and just about any bread making. Thank you for the great info. I used goat milk, at first it wasn't seperating, then I kept it at a low boil and it seperated. Some crumblyness can be from the curds staying too hot for too long. Thankyou that was just what i was looking for,perfect you made it sound so easy. Thanks for this. Can this be made with lowfat or fat free milk? Also, where can I find this cheesecloth? My first attempt didn't go too well, I still ate it though! Hello, I know this is an old post, but I made your paneer recipe this past week and I wanted to let you know how well it turned out. Thank you for your lovely photos and delicious recipe. So glad it worked for you :) Would love to see the photos of your paneer. Thank you - this recipe was perfect! 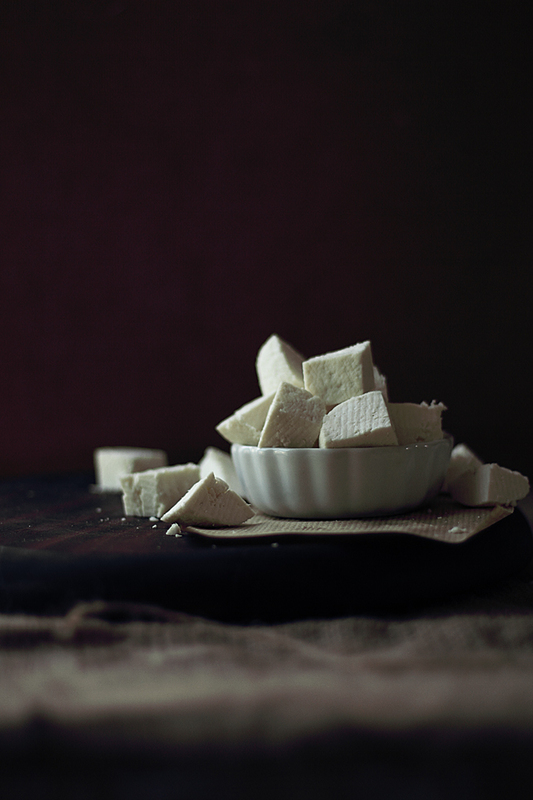 I tried it at my very first paneer attempt at home & had beautiful soft cubes in 1 hour. I have some lovely pictures to share, but not sure how to upload them here. So glad the recipe worked for you! Could you please send the photos to kulsum@journeykitchen.com ? Would love to share with the readers. I had never tried Paneer. But was waiting for the illustration I think at correct time I landed on your blog. I tried your recipe (never made paneer before), and my curds didn't completely pull together into one solid piece. In other words, the paneer is crumbly, and got that way even before the pressing stage. Did I cook the milk too long after putting in the lemon juice? I used a bottle of Real Lemon (didn't squeeze lemons), and added 3.5 TBS, because I was worried the curds weren't forming. Too much lemon, maybe? Would I get better results with real lemons (as opposed to the bottled juice)? Could the milk have been on too high a boil? I'll still use it in my mattar paneer (it tastes good, just looks odd), but won't serve it to anyone outside of my husband and me! There could be couple of reasons why your paneer didn't come together. Before the pressing stage, the curdles do look all separated but when there is the right moisture and consistency, it should after pressing form a block. Firstly, please don't use the lemon from a bottle. Whatever they add in there along with the juice will interrupt the process. Real lemon juice will curdle the milk faster and with lesser juice which is ideal. Once the milk curdles make sure you take it off flame immediately and run it under cold water which will stop it from cooking any further. After curdling if it remains on heat, curdles become rubbery and hence wouldn't come together. For the same reason, make sure as mentioned in the post that your milk shouldn't be on a rolling boil. Just made it, can't wait to taste ... but I can't imagine having to throw away the left over milk ... what can you use it for? It would quite literally break my heart to throw it away. Great pics btw. You made this seem so simple. And the pictures are stunningly beautiful makes me want to make it right away, so that I can use it for saag paneer. Thank you for posting this recipe. One question though, I have used this method to make what I call "pot cheese." After pressing, it turns out fine, but when I try to fry it as for saag paneer, it just melts, and doesn't retain its cube shape. Why is this? I heard somewhere that using pasteurized milk may be the problem. What kind of milk do you use? 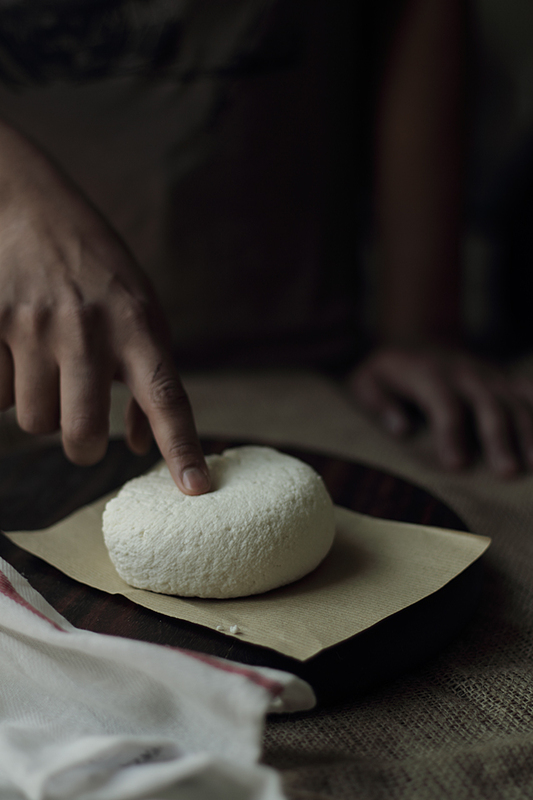 I love this tutorial--the first I've seen that helps people understand hand-making cheese! Can't wait to integrate this for saag paneer! Do you (or anyone else here) know if it would work equally well with sheep or goat milk? I don't digest cow milk very well, particularly in the States, so I'd appreciate your thoughts! Hi Alicia - I have never tried another milk so I can't be sure but I would think it should work. My only concern would be if it stays intact. I have a feeling it might be more crumbly. Can this recipe be made with goat milk for those of us who cannot digest cow milk? Further, do you recommend the use of whole milk rather than lower fat varieties? Thank you for sharing this technique...it emboldens one to attempt it. I would just like to try it with the goat milk...I think the flavor would be wonderful. I think that goat cheese wouldn't set like cow's milk and will be quite soft but that's not necessarily a bad thing! very well explained.i try this technique with fresh milkfor home made paneer. Thanks, Nicely explaind. I added little salt that added the taste. Thanks again. I just made this with a gallon of skim milk and a quarter cup white vinegar. It turned out perfectly. I'm guessing I got a pound of cheese. Hi Kulsum, thank you for posting this recipe. I first made paneer following your recipe last year and have since made it many times over. It works so well and I truly enjoy the process of making the cheese and obv. having home made paneer, it beats the store bought one without a doubt. Thank you!